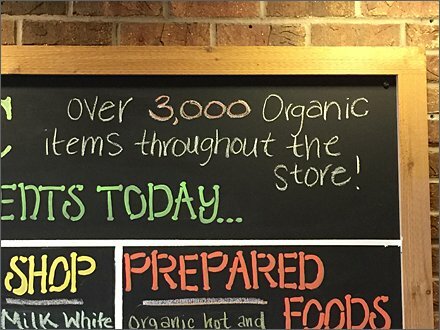 If organic food is your thing, Legmen’s® let’s you know that theirs is the Supermarket to shop with this store-entry hand-lettered sign. 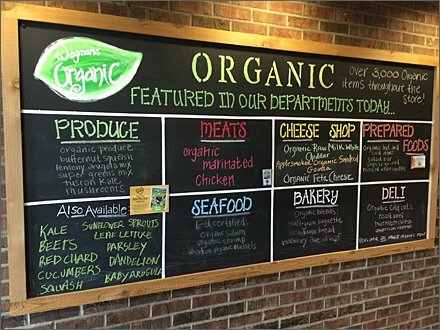 Use of a chalkboard and hand-lettered themes adds a sense of immediacy and “freshness” to the offer. A breakdown by department steers traffic, and further justifies Wegman’s as a center for organic foodstuffs. CLICK the thumbnail for the pivotal punchline to this promotion.